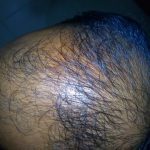 Androgenetic or pattern alopecia is a genetically determined disorder characterized by the gradual conversion of terminal hairs into indeterminate, and finally into vellus, hairs. It is an extremely common & progressive disease that affects men and women. It is also known as male-pattern baldness, female-pattern baldness, or just common baldness. The common pattern in men is the loss of hair first from the temples, and then from the crown. However, in women the hair loss may be much more diffuse, particularly over the crown. In bald areas, terminal hairs are replaced by finer vellus ones. It affects about 50% of men over the age of 50, and about 50% of women over the age of 65. In women the severity varies, it may present as widespread hair thinning but in some cases it can lead to complete baldness. Androgenetic alopecia affects men earlier, and more commonly, than women. Males typically become aware of scalp hair loss or a receding hairline, beginning at any time after puberty. In women, the age of onset is later compared to men, usually occurring in the 50s or 60s. Occasionally, androgenetic alopecia in womenmay start earlier than this, in the 30s or 40s. In some women, this condition can be associated with an excess of male hormones such as in polycystic ovary syndrome. Acne, increased facial hair, irregular periods and infertility are all signs of polycystic ovary syndrome. Although clearly familial, the exact mode of inheritance has not yet been clarified. The idea of a single autosomal dominant gene, with reduced penetrance in women, now seems less likely than a polygenic type of inheritance. Male-pattern baldness is androgen dependent. In females, androgenetic alopecia, with circulating levels of androgen within normal limits, is seen only in those who are strongly predisposed genetically. Besides, androgenetic alopecia is caused by a combination of genetic and hormonal factors. Dihydrotestosterone (DHT) is the main hormone responsible for androgenetic alopecia in genetically susceptible individuals. DHT causes scalp hair loss by inducing a change in the hair follicles on the scalp. The hairs produced by the affected follicles become progressively smaller in diameter. Shorter in length and lighter in colour until eventually the follicles shrink completely and stop producing hair. Although the method of action is essentially unknown, minoxidil appears to lengthen the duration of the anagen phase, and it may increase the blood supply to the follicle. Regrowth is more pronounced at the vertex than in the frontal areas and is not noted for at least 4 months. Continuing topical treatment with the drug is necessary indefinitely because discontinuation of treatment produces a rapid reversion to the pretreatment balding pattern. Patients who respond best to this drug are those who have a recent onset of androgenetic alopecia and small areas of hair loss. The drug is marketed as a 2% or a 5% solution, with the 5% solution being somewhat more effective. Finasteride is given orally and is a 5-alpha reductase type 2 inhibitor. It is not an antiandrogen. The drug can be used only in men because it can produce ambiguous genitalia in a developing male fetus. Finasteride has been shown to diminish the progression of androgenetic alopecia in males who are treated, and, in many patients, it has stimulated new regrowth. Although it affects vertex balding more than frontal hair loss, the medication has been shown to increase regrowth in the frontal area as well. Finasteride must be continued indefinitely because discontinuation results in gradual progression of the disorder. Some drugs are not approved by the FDA but are potentially helpful medications. In women with androgenetic alopecia, especially those with a component of hyperandrogenism, drugs that act as androgen suppressants or antagonists (eg, spironolactone, oral contraceptives) may be beneficial. Evidence exists of an association between androgenetic alopecia, hypertension, and hyperaldosteronism. Spironolactone could play a dual role in treatment. Dutasteride is another possible treatment for androgenetic alopecia. This drug inhibits type I and type II 5-a reductase isoenzymes and is felt to be 3 times as potent as finasteride in inhibiting the type II enzyme and 100 times as potent in inhibiting the type I enzyme. A study by Singh et al suggested that botulinum toxin may be a viable treatment for androgenetic alopecia in males, since intramuscular infection of the drug into the scalp results in muscle relaxation and, therefore, increased blood flow. Low-level laser light therapy, in particular a red light hairbrush–like device has been used for hair growth. Surgical treatment of androgenetic alopecia has been successfully performed. Although the cosmetic results are often satisfactory, the main problem is covering the bald area with donor plugs (or follicles) sufficient in number to be effective. Micrografting produces a more natural appearance than the old technique of transplanting plugs. Patients with less than 40 follicular units/cm2 in their donor areas are poor candidates for the procedure. Scalp reduction has been attempted to decrease the size of the scalp to be covered by transplanted hair. The scars produced by the reduction technique often spread and become more noticeable with time. Patient wants to know the cause of alopecia. So, visit a doctor. 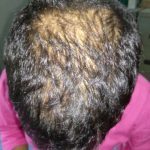 Doctor will identify the cause of alopecia is essential for treatment & plane of treatment. It anyone need surgery, need to consult with a dermatologist.